Heat oven to 450°F. Spray 13x9-inch (3-quart) glass baking dish with cooking spray. In large bowl, mix melted butter, 1/2 teaspoon of the salt and 1/2 teaspoon of the pepper. Stir in potatoes, carrots and onions. Pour into baking dish. Rub chicken all over with remaining 1 teaspoon salt and 1/2 teaspoon pepper. Place thyme, rosemary, garlic and lemon wedges in cavity of chicken. If desired, tie legs together with 6-inch piece of cooking twine. Place chicken, breast side down, on top of potato and vegetable mixture. Roast 30 minutes; carefully turn chicken breast side up. Continue to roast 25 to 35 minutes longer, until legs move easily when lifted or twisted (at least 165°F in thickest part of thigh) and potatoes are tender. Master carving a whole chicken once and for all. It’s not hard with Betty’s article on how to carve a chicken. Scared of turning the bird? Place chicken breast side up, and you can skip this step completely. The skin on the bottom won’t get as crisp, but the bird will still cook just fine. If desired, serve with additional sprigs of rosemary and thyme. Potatoes are kept in big pieces, so they don’t overcook by the time the chicken is cooked through. You do want pieces to be roughly the same size, so they cook evenly. If some potatoes are larger, simply cut in 6 pieces. The cooking liquid can be served alongside the carved chicken, like au jus. To leave some of the juices behind, use a slotted spoon to serve the vegetables. If you can only find large lemons, cut off the thick ends, and only use about half of the wedges. When starting with a frozen chicken, you’ll want to consult our poultry thawing chart, so you can plan for enough time to thaw safely. 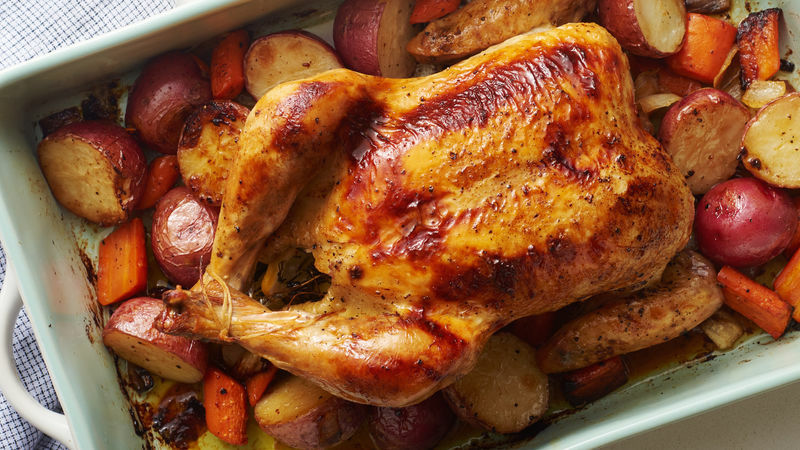 If you love roasted chicken (and honestly, who doesn’t? )—keep the rest of our whole chicken recipes handy.